Jones Tweeted his frustration with candidates who fail to highlight notable achievements and said: "Oh really? One of your responsibilities worth noting to employers was to be on time to work? #KillingMe"
Since hiring managers and recruiters like Jones sift through hundreds of resumes, they're bound to come across a few gems like these from time to time. And by gems, we mean face-palm-worthy bullet points! 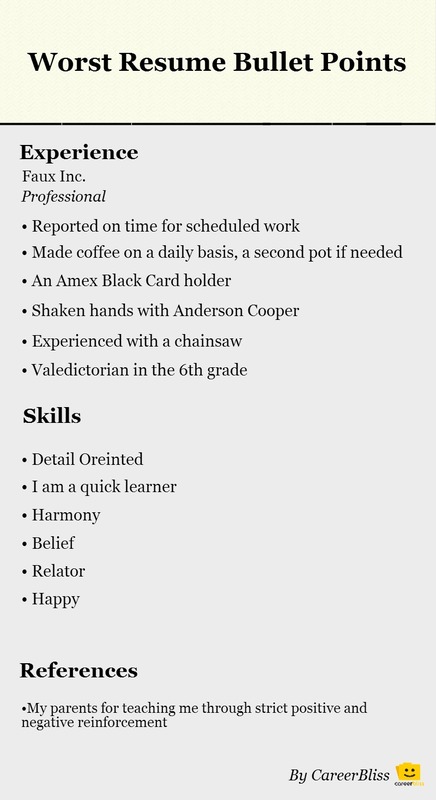 This resume was sent for a job at Bloomingdale's in New York. Several managers mentioned spelling bloopers. Please, folks, spell check! "Love the word, but would rather see that in a cover letter." These three words were listed under "Skills"
-- Mike Ketcham, general manager at Weather Radios Direct. The phrase is just a bowl of snooze! This was listed under "References." Anything before college usually doesn't belong here! Apparently, this appeared multiple times in a resume for a sales position. -- Meg Favreau, senior editor at WiseBread.com.